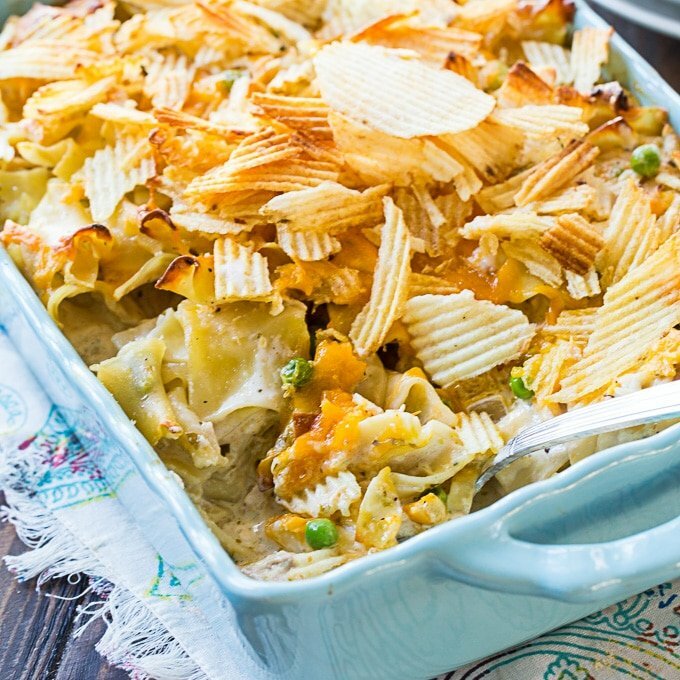 This delightful From Scratch Tuna Noodle Casserole contains no canned soup and is wonderfully creamy with a crunchy potato chip topping. 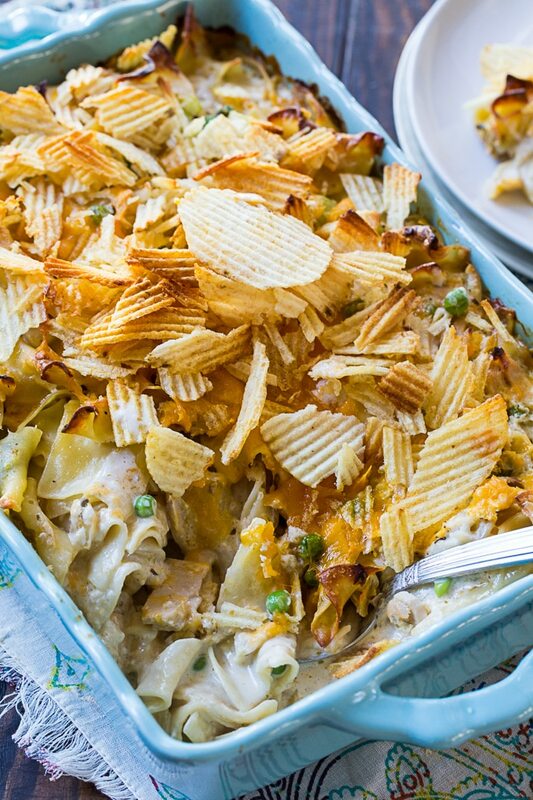 This is seriously one of the most delicious casseroles I have ever eaten and it’s such a classic American dish. 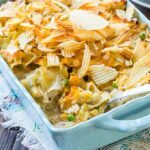 From Scratch Tuna Noodle Casserole is a wonderful combination of egg noodles, creamy sauce, cheddar cheese, and peas. This recipe is adapted from the Country Cooking from a Redneck Kitchen cookbook and it is a winner. The best thing about this recipe is the homemade Cream of Celery Soup. It does add an extra step, but it is so worth it. Alot of celery is used to make it but don’t worry, the celery flavor does not overpower it. Use a good quality canned tuna. I like to use solid albacore tuna for this recipe. It costs a little more but has less fishy taste. As a negative, it also has a higher mercury content. Use the kind of tuna you use to make tuna salad and you should be happy. Using a homamde sauce gives this cassrole a superior flavor and as a bonus, it allows you to control the salt level. I like to use a crushed potato chip topping. I use a wavy chip, but you could use crushed crackers or bread crumbs instead. 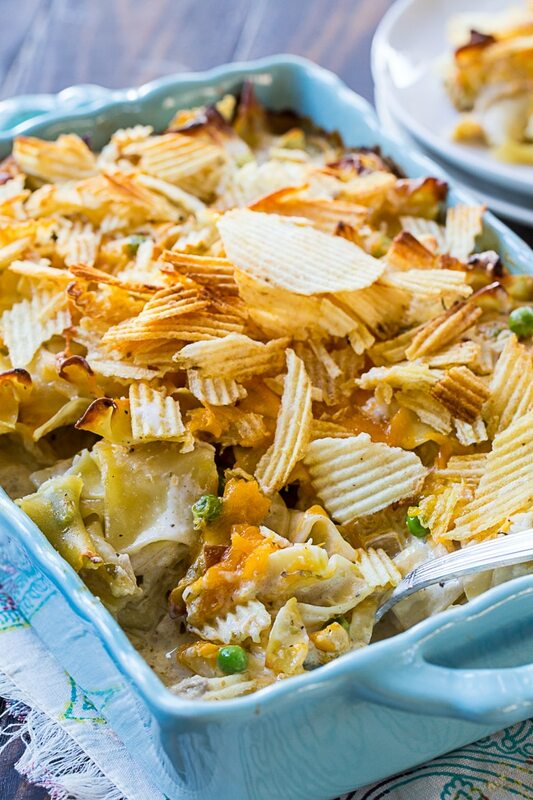 This delightful From Scratch Tuna Noodle Casserole contains no canned soup and is wonderfully creamy with a crunchy potato chip topping. Make homemade Cream of Celery Soup. In a large saucepan over medium-high heat, melt butter. Add celery and onion and cook until soft, about 8 minutes. Add tarragon, reduce heat to low and add the buttermilk and cream. Simmer until somewhat reduced, about 20 to 25 minutes. Season to taste with salt and pepper. Use an immersion blender to blend until smooth or transfer mixture to a blender and blend until smooth. Measue out 2 cups to use for the casserole and you can freeze the rest for a later use. Cook egg noddles according to package directions, but shave a minute or two off of the cooking time so that they are slightly undercooked. Drain well. Preheat oven to 325 degrees and lightly grease a 9x13-inch baking dish. Saute the celery and onion in the butter until soft. In a large bowl, mix together mayonnaise, 2 cups Cream of Celery Soup, evaporated milk, 1 1/2 cups shredded cheddar cheese, the celery/onion mixture, the tuna along with the liquid in the can, peas, and pepper. Stir in egg noodles. Transfer mixture to prepared baking dish. 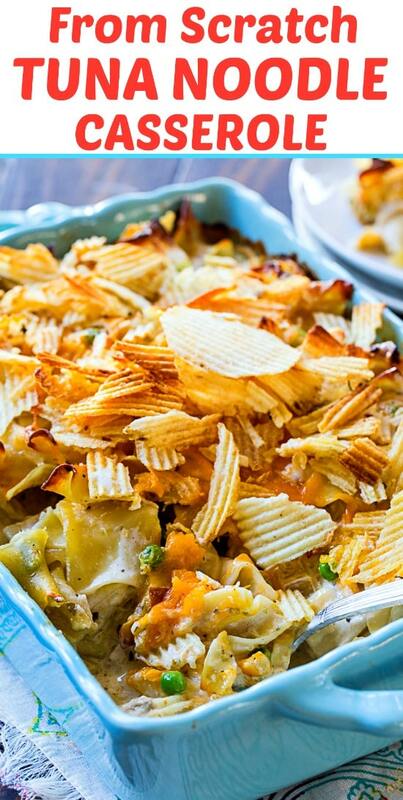 Sprinkle remaining cheese and potato chips on top. Bake for 30 minutes. This entry was posted in Casseroles and tagged seafood, tuna. Bookmark the permalink.